The most formidable door that humans face is the door of death! Throughout history no man has been able to break down this door ... except one! All religions have the graves of their founders, and inside them lay the bodies of these men ... but one grave is empty, the grave of Jesus outside of Jerusalem! and if we believe in Him, we too will never die! ~ He is not here; He has risen! trusts in, relies on, and has faith in Me] has (now possesses) eternal life. to teach children about the true meaning of Easter. Use coconut sugar or palm sugar, or raw rapadura sugar or dextrose/glucodin. In Each plastic egg place an item that symbolizes a part of the Easter story along with the appropriate scriptures. in which he was buried only a few days earlier. This project symbolizes the burial and resurrection of Jesus. 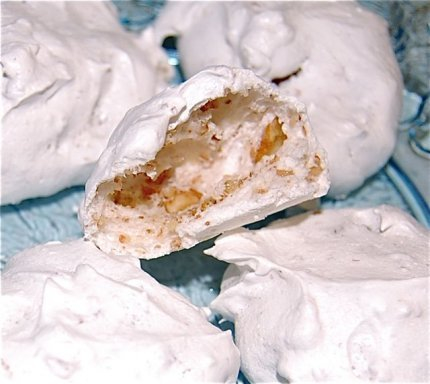 The only ingredients needed are crescent roll dough, marshmallows, butter, cinnamon and sugar. 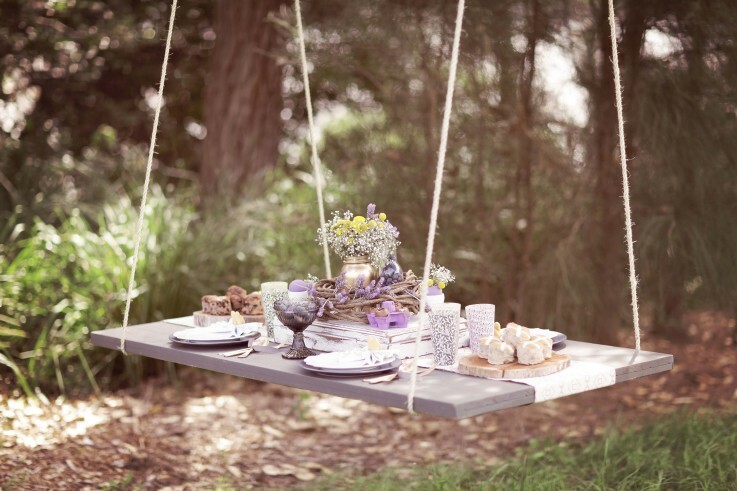 are so simple to make and yet very nice looking and personal. Angel Rolled the Stone Away Craft found at DLTK. You probably already have all the supplies on hand. 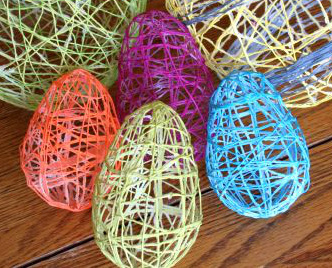 Here are some fun and Easy Kids Easter Crafts from Amy at Living Locurto. Check out these Free Easter Printables at Living Locurto. She has Easter cards, stickers and a coloring sheet. All you have to do is download and print them. Like Cadbury’s Creme Eggs -but healthy. Make caramel cream by blending all ingredients on HIGH in blender until smooth. OR to melt oil etc - stir til smooth in a small jug or bowl -placed in a pot of hot water. Pour chocolate into each egg mould so 1/3 is filled. Set in fridge, til choc will push up sides of egg. be careful not to add too much as you want it to be encased in chocolate. Then pour over some more chocolate so there is no trace of the filling. Set in the fridge or freezer. Use half egg moulds or any large mould or sturdy cupcake case. -from a little cup with lip or a teaspoon -around the square shape. Use 3 colours of choc -ie white, dark and dairy. Make 6 choc squares. Make sure the inner squiggles touch the edges and each other..so it stays together after refridgeration. 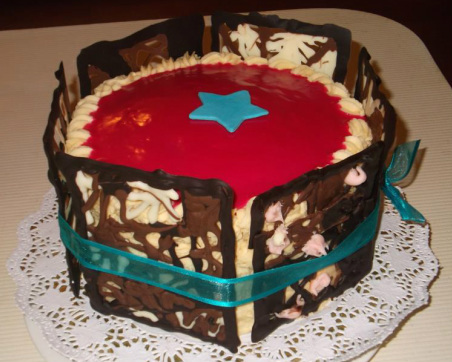 then place the choc squares around an iced or creamy cake, tie ribbon in place. Maybe deco centre of cake with more choc drizzles or make another square and/or place choc eggs in centre. mix together in a cup, placed in a pan of hot water. Remove from heat, sit to thicken a little, then drizzle, - warm choc again if it sets. 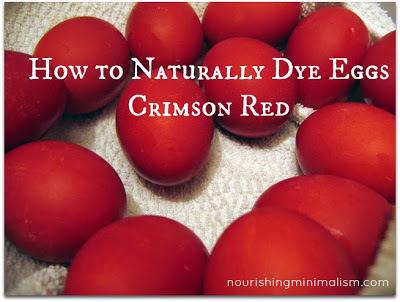 Dye Easter eggs red to represent the blood of Christ. Add all ingredients to a pot, boil for 30 minutes, with a lid on. Allow water to cool. turn the burner back on to hard boil them- as they cook they will turn a beautiful crimson color. These photos aren't edited- this is the real color of the eggs! I will never go back to food coloring again- God's natural colors are so much more vibrant!! Another bonus- the color doesn't come off on hands. After Easter dinner, we go around the room, cracking the eggs against each other to see who's egg can "win". and came and rolled back the stone from the door, and sat on it." He is no longer there, He is risen! Use Shaving Cream and food coloring (dark colors) - roll in shaving cream, let sit, wipe off. fold/circle twine/thread/wool into the glue press down til covered, wind onto balloon, let dry. Idea -cut in half and fill with chocs and sew or glue it back together with pretty tape. 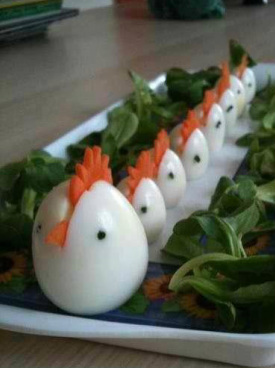 Slit tops of hard boiled eggs and place serated carrots in for combs and beaks, Make eyes with poppy seeds. try mashed pumpkin for orange. Tip, After hard boiling the eggs, 1. crack them gently all over, don't peel yet. The important thing is to NOT roll the eggs more than a couple times. Any more and you end up with solid color eggs. 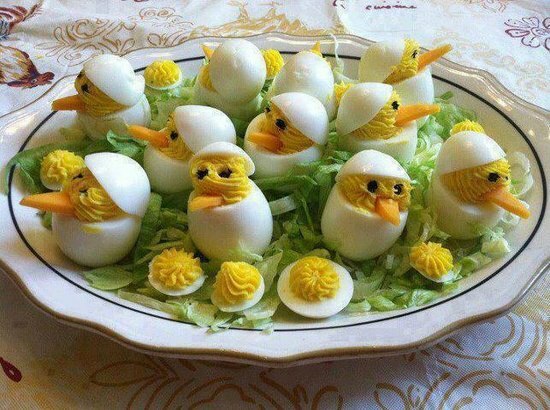 Put a few hard boiled eggs into colander and splash with white vinegar. Starting with lightest color, put one drop of food coloring onto each egg. Roll around the colander just a couple times. Take your second color and place a drop on each egg and roll a few more times. Let sit for 5 minutes for the dye to set. Rinse under cold running water. Pat dry with a paper towel and let fully dry for at least an hour. -wear rubber gloves if you don't want dye on your hands. It stays on the skin for a few days. -put plastic wrap on your counter under where you'll be drying the eggs. The dye tends to stain the counter tops. -don't use more than 2 colors per egg or the colors became too blended. -only place a few eggs in the colander at a time. Too many and they break the shells. -make sure you let them sit the full 5 minutes. Any less time and the colors will be pastel and muted (which is fine if you're going after that look).